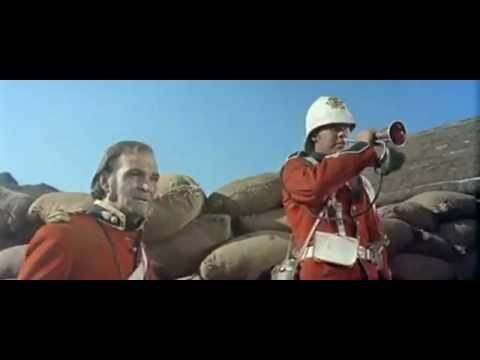 Synopsis: Outnumbered British soldiers do battle with Zulu warriors at Rorke’s Drift. Some movies, while perhaps not particularly well-written, have as their source material a true story of such staggering courage and determination that it’s almost impossible to resist becoming swept up in its emotion and drama. Cy Endfield’s Zulu, which was co-produced by its star Stanley Baker, for whom it was a project of personal importance, is one of those movies. It’s won a place in the hearts and collective consciousness of a generation of British, and encapsulates that bulldog spirit of which we have traditionally been so proud. Zulu also possesses a few occasional moments of such astonishing corniness that it seems inconceivable that they found their way into such a solidly constructed, first class action movie. Zulu recounts the event surrounding the battle of Rorke’s Drift in January 1879, in which a unit of approximately 150 British soldiers heroically held off around 4,000 Zulu warriors following the disastrous (for The Brits) Battle of Islandlwana, in which 1,800 British and allied troops were wiped out by 20,000 Zulus, marking the start of the Anglo-Zulu war. Around 4,000 of those warriors were still spoiling for a fight and marched on to Rorke’s Drift, a makeshift garrison standing on the border between the British colony of Natal and the Zulu kingdom. Alerted to their advance by a couple of survivors from the earlier battle, the unit immediately set about hastily constructing their defences, an operation co-ordinated by Lieutenant John Chard (Baker), a member of the Royal Engineers who was temporarily based at Rorke’s Drift to oversee repairs to a pontoon bridge. The garrison was actually commanded by Lieutenant Gonville Bromhead (Michael Caine — The Dark Knight, Inception), who deferred to Chard because of his profound deafness — although his affliction is not referred to in the movie, in which Chard assumes command of the unit on the strength of his receiving his commission three months before the other officer. Zulu takes plenty of time introducing us to these, and a number of other, characters as it builds towards the battle which occupies the movie’s final hour. Many of these are minor characters, but amongst the more significant are Henry Hook (James Booth), a malingerer in the garrison’s hospital who displays an unexpectedly heroic side when Zulus start looking through the windows (although depicted here as an alcoholic malingerer, the real Hook was a teetotaller and a model soldier, and his cruel misrepresentation prompted his daughters to walk out of the film’s premiere). Otto Witt, a fervent missionary with a secret drink problem, whose misguided sense of humanity succeeds in persuading native troops to flee, is played with relish by Jack Hawkins (Great Catherine, When Eight Bells Toll), while Ulla Jacobsson has nothing to do as his daughter, leading one to suspect that her character was created purely to provide some feminine interest. Endfield and John Prebble’s script introduces us to each of these characters in a measured fashion with varying degrees of success. The Witts, both fictional characters created for the movie, feel superfluous, but the relationship between Chard and Bromhead, and its progression from jocular adversity to mutual respect is nicely chronicled. Caine, playing in his first major role against type as an upper-class officer, delivers a convincing performance which propelled him to stardom, while Baker does a good job of understating the stiff upper lip tendencies of his character. But, of course, few people remember much of that build-up from this movie because it’s overshadowed by the monumental battle scenes that follow. To be honest, Endfield struggles to convince us that the besieged soldiers are squaring up to thousands of Zulu tribesman because we never see more than a few hundred at a time, but he overcomes this deficiency with action sequences of unprecedented ferocity for its time. These battle scenes aren’t just impressive — they’re downright electrifying, especially when played out against a big musical score that is both stirring and ominous. These scenes lift the movie to a level it would never have attained otherwise because they allow us to overlook some truly cheesy moments, such as a dying soldier’s querulous ‘why?’ as he briefly rises from the operating table upon which he is about to die, and Hook’s unaccountable and sudden change of heart about participating in the fighting.